We believe in the ART of visual storytelling. We also believe in quality. Award-winning video production, post production, motion graphics, training and publications. We’re equipped to shoot on location or in the studio; or teach you and your crew how to do your own productions! 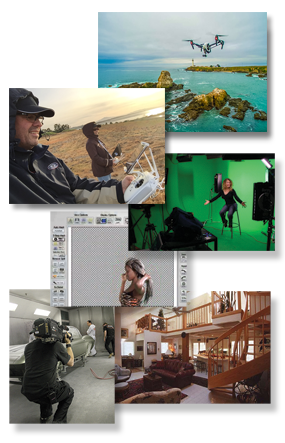 Whether it’s shooting your commercial or corporate messaging, customer testimonials, product photography, aerial photos/video, training and demonstration videos, animated infographics or shooting and compositing your green screen productions on location or in the studio, Sound Visions Media will help you expand your visual creativity! Sound Visions Media will help you creatively showcase your message to the world. This entry was posted in Uncategorized and tagged "green screen" "motion graphics" animation, "video production" post-production, "visual effects" compositing, editing, greenscreen, motion graphics, photography, PR, promotions, publicity, vfx, Video, videography. Bookmark the permalink.